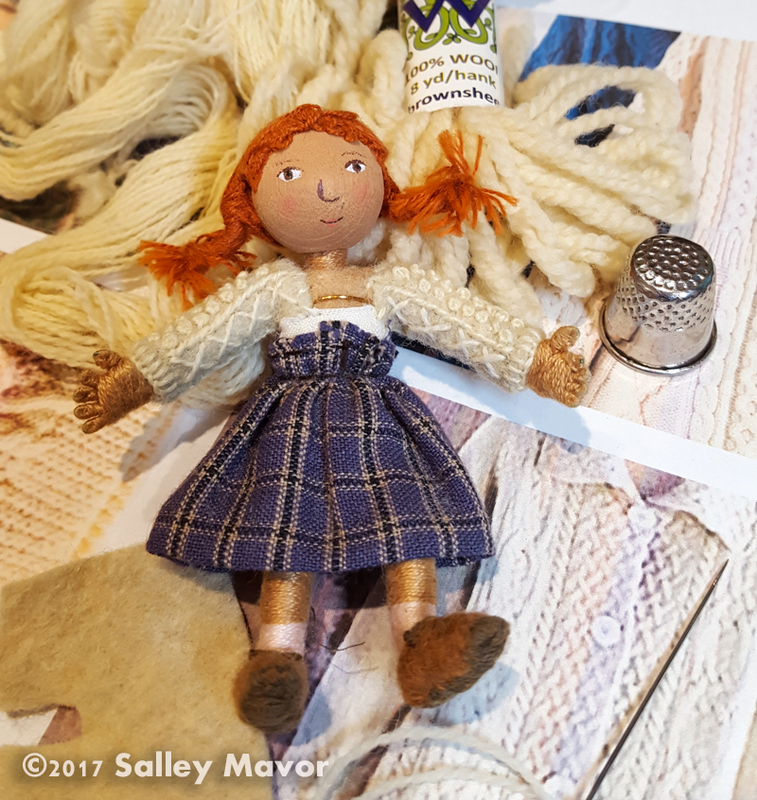 This entry was posted in Dolls, Ireland, Polly Doll by Salley Mavor. Bookmark the permalink. Polly is adorable! I would love to visit Ireland again. Happy trails, Polly! Have a wonderful time, Polly! You will enjoy your new outfit in Ireland! Send photos! L O V E Polly’s sweater. Thank you Salley for seeing us through the last nine months. Have a wonderful trip. I love your traveling outfit. Hope you are going to the wild Atlantic. Safe travels Polly. You too Salley. Have a wonderful trip, Polly and friends! We wish we could be with you again on this trip! We have had some great trips, Mary. This one also involves music, but in one spot. I’m super excited about your new book about beds. Hope you will share as you progress through it!! Thanks Diane. 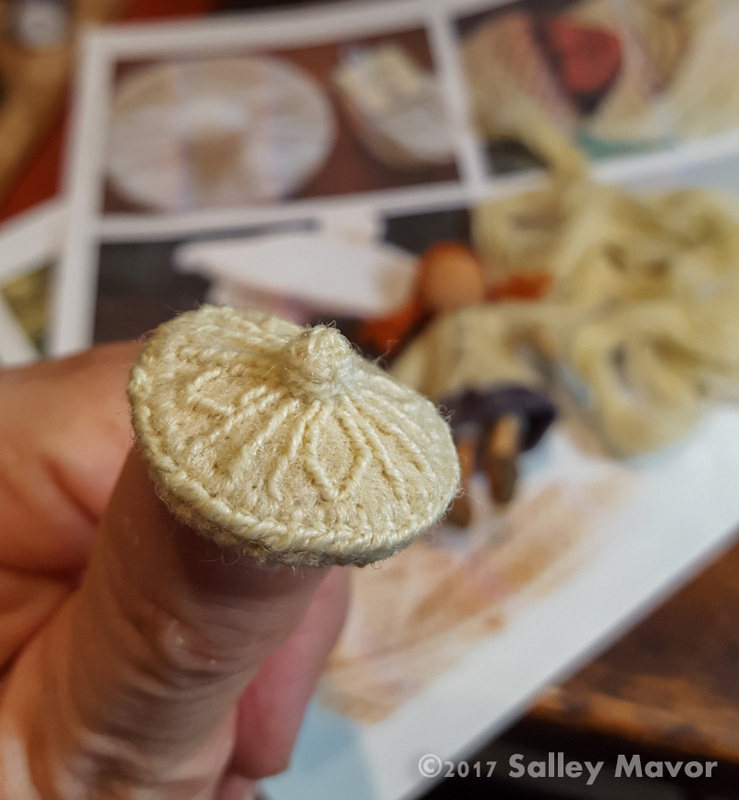 It’s the first time I’ve worked on a book since starting this blog and other social media, so I’m unsure how much I can show before the book’s published. Right now, I figure that close up process photos will be OK. Your new book looks and sounds delightful!! I cant wait to watch it unfold!! 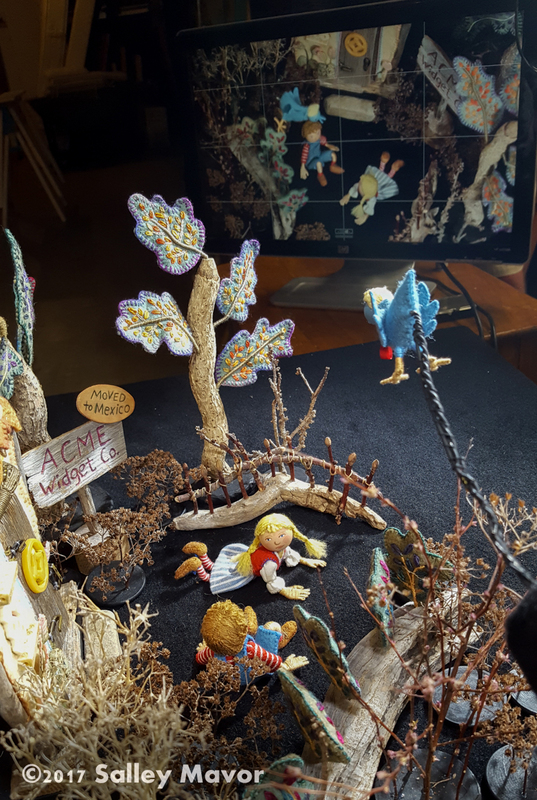 I have to tell you how entranced I was by your fairy house at Highfield House! I saw it this summer right before I came over to the Falmouth Art Center for your opening. Also I have to thank you for agreeing to let me get a picture of the two of us together!! Such a fan girl thing to do but I had to ask! That little fairy house is a total delight and brilliant use of unusual materials. I love seeing how artists use found objects!! Thank you for sharing what you do with all of us!! Polly, you will blend right in. No one will know you are from Cape Cod. What are you wearing, Salley??? 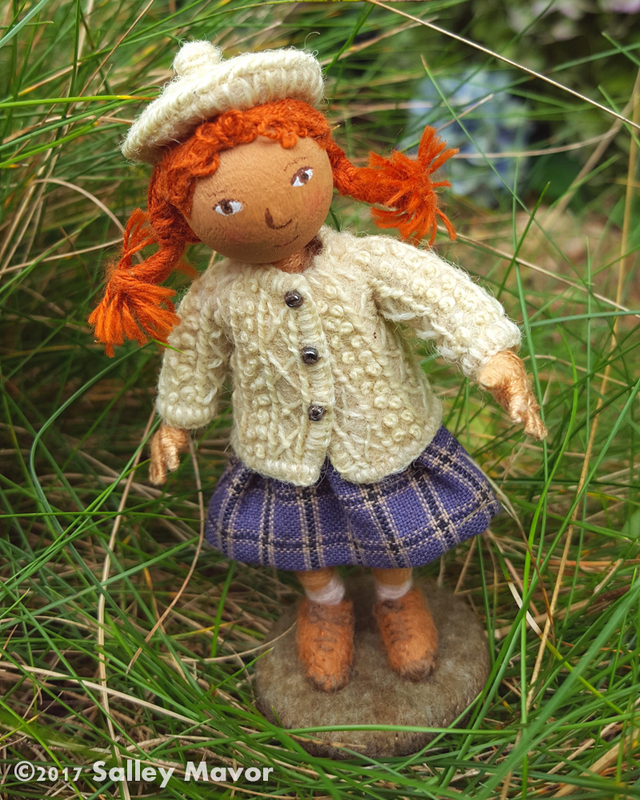 Oh my ….. Polly looks sooooooooooo CUTE in her new warm Irish-knit jacket !!!!! Absolutely adorable! Your creativity inspires me! I’m in love with your work!! Sally, you’ve done it again! Poly is sensibly but very fashionably outfitted for her trip to Ireland. 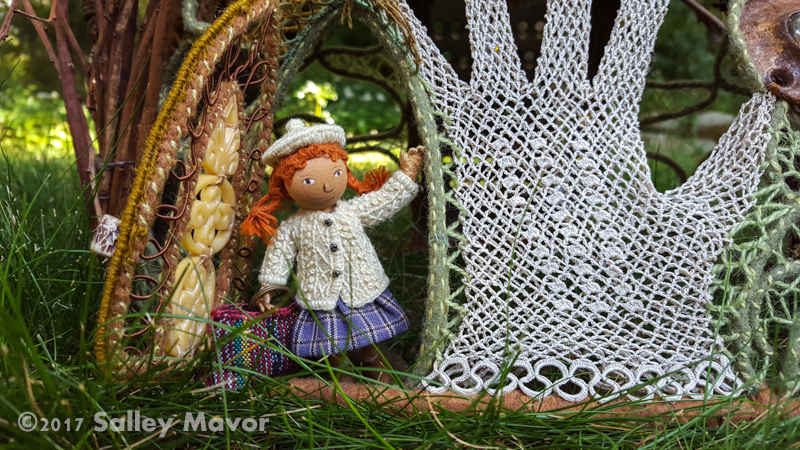 Her fisherman’s knit sweater, her tam, and red hair will allow her to blend in perfectly, now all she needs is anything Irish brogue! Safe travels to all. Bon Voyage! I love the outfit. So celtic! 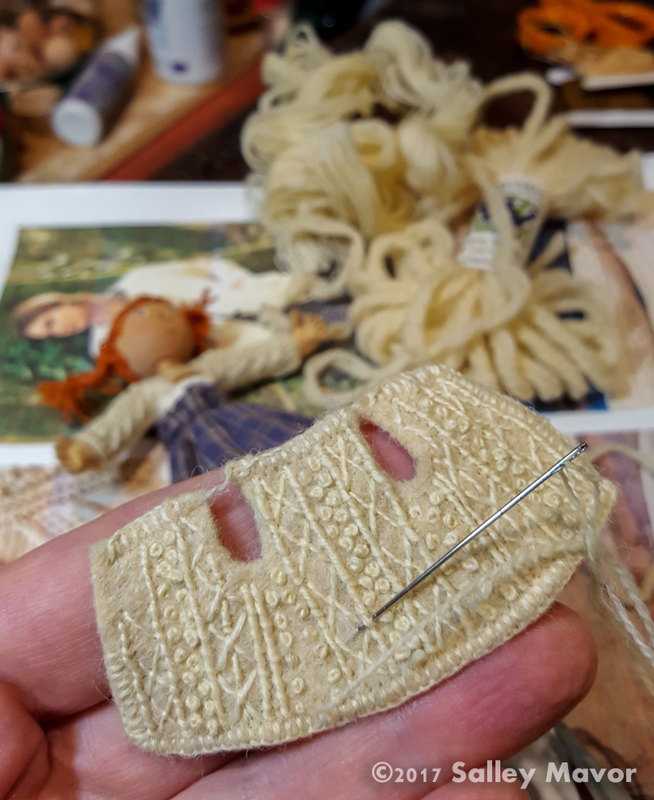 I am crazy about your faux Irish knits! Wonderful! 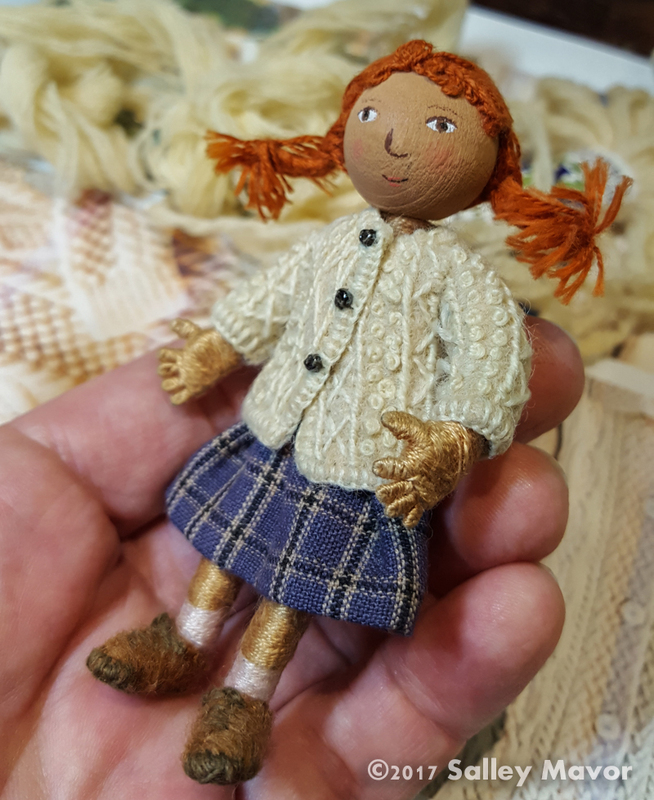 Polly is such a lucky doll – and she has an amazing dressmaker! Have fun, Polly! I love Polly’s sweater the best. Wonderful work. Beds made me think about what I used to sleep on as a child. Being Navajo I slept on goat skin. After a while my mother did away with those. But I look forward to your book. Absolutely adorable….. the sweater is the best. That faux-knitted sweater is spectacular! Have the best time — I look forward to pictures. Exquisite sweater and tam. She looks beautiful! Love the detail in the blanket and the vest. Pretty!